wow, Christmas went by so fast!! it always seems to go that way when you get to visit with people you see rarely. having Brother Pawlish here was just wonderful, i'm so happy he was able to spend Christmas with us :) Mr. Pawlish and i went to visit all the Pawlish Siblings on my side, and Brother Pawlish stayed with them for New Year's. pretty awesome to see them all in one place! today i have Coal Hands, Warm Heart from China Glaze Cheers! to share! (it's a press sample, kindly provided to me for review). the three polishes i will be reviewing from Cheers! this week are the perfect ones to wear to a New Year's Eve party... or anytime you're ready for some fun sparklies :D Coal Hands, Warm Heart is a glitter with different sized holographic hex pieces... it's really special! 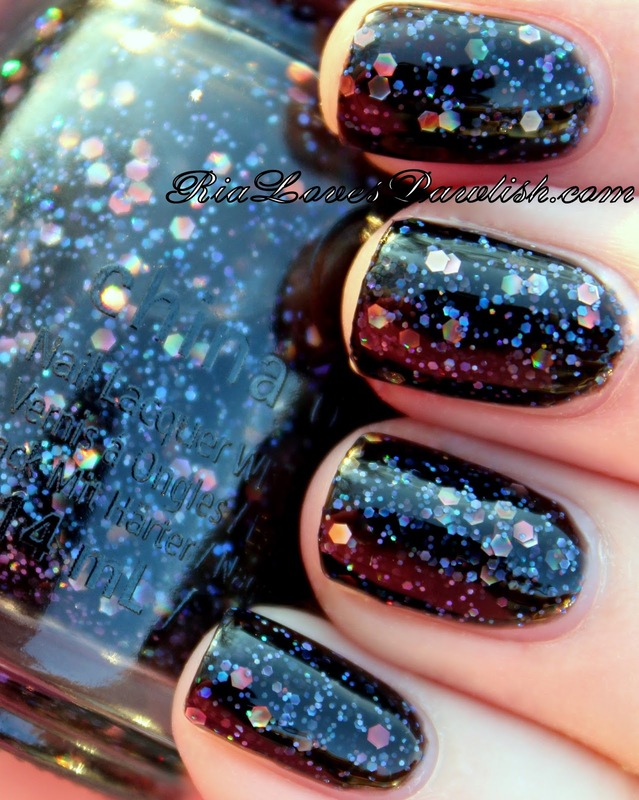 probably what makes it really stand out from other polishes like it is the sheer black base... it's easily brought up to full opacity in three coats, but you're to see so much depth in the three layers... just like stars in the night sky. you could just top one coat over a black creme polish to get a *similar* effect, but you wouldn't get all the dimension... so i recommend using this baby on its own. definitely go for a coat of topcoat to seal everything in, and this one doesn't dry particularly shiny so it will need that glossy boost. three coats Coal Hands, Warm Heart, one coat Salon Perfect Crystal Clear Top Coat. you can find China Glaze products in salons and beauty stores... my favorite place to buy China Glaze is Sally Beauty Supply! check out China Glaze on their website, www.ChinaGlaze.com! thank you so much!! this polish is so gorgeous :) please email me (RiaLovesPawlish@gmail.com) if you get a chance and let me know how you like it. much love from the US! China Glaze Cheers!... Wine Down For What?